Planet Hollywood Las Vegas, previously known as The Aladdin, is a casino resort on the Las Vegas Strip, in the unincorporated locale of Paradise, Nevada, United States. Westgate Resorts operates the condo portion of the property, known as PH Towers by Westgate. Planet Hollywood is owned by Caesars Entertainment Corp. In April 2010, Total Rewards replaced the “A-List” Player rewards card at Planet Hollywood. 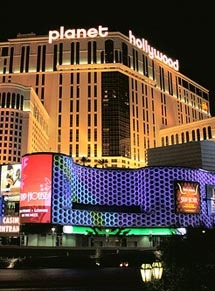 Planet Hollywood has hip and modern architecture fitted to its Hollywood theme. 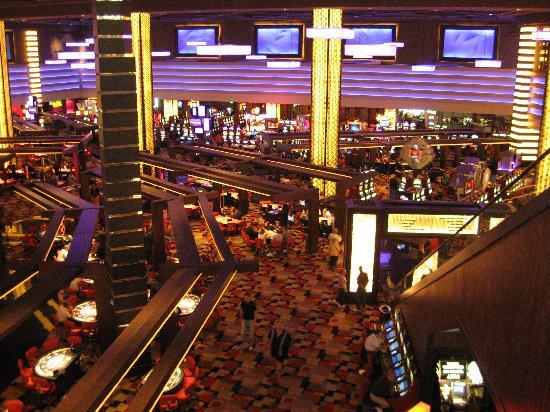 It features a three-acre casino floor full of traditional gambling machines like slots, table games and The Playing Field Race and Sports Book. This features 33 plasma screens, two jumbo screens and a section for VIP. Planet Hollywood is the first Las Vegas resort to offer table games dealt by young ladies in “chic lingerie”. This can be accessed by taking an escalator in the casino or the elevator. Here, guests can relax on comfy chairs overlooking the casino. Many come to smoke, relax or think. The area is rather spaced out with room to walk and includes a place for shooting basketball hoops. It includes a “Living Room” with sofas to be accessed by the guests. The Planet Hollywood showroom is also located on the mezzanine. It features several different live shows; as of 2010, the most popular and longest-running is titled Peepshow starring Holly Madison. A live version of the television series America’s Got Talent hosted by Jerry Springer (who flies to Vegas weekly from his self-titled show’s taping in Stamford, Connecticut) and Tony n’ Tina’s Wedding played on the Mezzanine in 2009. “The Spa by Mandara” is located on this floor. Two fine dining restaurants, KOI and Strip House are present here, across from the wedding chapel. Planet Hollywood Resort features rooms that meet its Hollywood theme. The resort has 52 floors (with the final two being VIP) and each room is dedicated to a certain movie such as Backdraft. Rooms feature actual props and memorabilia from the film. The rooms range from standard to luxurious “Panorama” suites with a view of the whole Las Vegas Strip. The swimming pool in this resort can be accessed through the sixth floor. The area overlooks the Strip with a view of the north and south. It features two pools and two hot spa one of each in both the South and North Strip. The one in the North Strip section features VIP cabanas for renting. In between is a bar/grill/snack-bar with a patch of grass lined with pool chairs for guests to sit and eat. 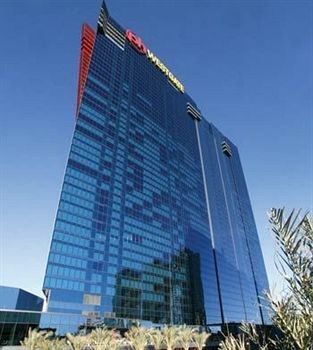 In late December 2009 Westgate opened the PH Towers, a timeshare and hotel linked with the casino and main hotel. Casino: Yes, 100,000-square-foot main casino with 2,800 slot machines and 87 table games. Plus The London Club, 35,000-square-foot European-style gaming salon operated in partnership with London Clubs International. Casino games include Blackjack, Caribbean Stud Poker, Craps, Keno, Let It Ride, Pai Gow Poker, Poker, Roulette, Slots, Baccarat, Wheel of Fortune, Megabucks and Super Megabucks. The casino has a poker room. Race & Sports Book: Yes, a 50-seat race and sports book, equipped with 30 televisions, including 42-inch plasma screens. Restaurants: Planet Hollywood and the Miracle Mile Shops have the following dining options: in Planet Hollywood: P.F. Chang’s China Bistro, Cabo Wabo, Spice Market Buffet, Planet Dailies, Strip House, Koi, Yolos, Earl of Sandwich, Starbucks; in the Miracle Mile Shops: Lombardi’s Romagna Mia, Aromi D’ Italia, Ben & Jerry’s, Blondies Sports Bar & Grill, Cheeseburger at the Oasis, FreshLa Salsa Cantina, Ocean One Bar & Grille, Oyster Bay Seafood & Wine Bar, Pampas Brazilian Grille, PBR Rock Bar & Grill,Todai Seafood & Sushi Buffet, Auntie Anne’s Pretzels and Créamo, Godiva Chocolatier, Nestlé TollHouse Café, Teuscher Chocolates of Switzerland and The Coffee Bean & Tea Leaf. Entertainment: V — The Ultimate Variety Show, Stripper 101, Marc Savard Comedy Hypnosis,American Storm, Sin City Comedy, The Mentalist, Gerry McCambridge, Hitzville The Show, Tony ‘n’ Tina’s Wedding, Piano! Las Vegas, Gregory Popovich’s Comedy Pet Theater and Echoes of the 60s are performed in the V Theater at the Miracle Mile Shops. VEGAS! THE SHOW, BeatleShow! and The Magic and Tigers of Rick Thomas perform in the new Saxe Theater also inside the Miracle Mile Shops. Entertainment is also featured in the 7,000-seat Theatre for the Performing Arts at Planet Hollywood.PEEPSHOW is performed in the Planet Hollywood Showroom. Amazing Johnathan performs in The Harmon Theater located on Harmon Ave., adjacent to the Miracle Mile Shops. Nightlife: Gallery , a 17,500-square foot nightclub, and the adjacent Pussycat Dolls Burlesque Saloon . There is Krave , a gay club, located adjacent to the shops. Pool: Yes, two 4,500-square-foot pools and two Jacuzzis. Spa: Yes, the 32,000-square-foot Planet Hollywood Spa by Mandara offers multiple types of massages and services. Shops: More than 150 world-class and one-of-a-kind retail shops and several unique restaurants can be found in the Miracle Mile Shops. Wedding Services: Yes, Planet Hollywood has a wedding chapel. Convention Rooms: Yes, a total of 75,000 square feet of meeting space including a 37,000-square-foot grand ballroom. Pets Allowed: Yes, but only in specific rooms. There is also a fee. In-Room Internet Access: Yes. Wireless high-speed internet access in guest rooms and many common areas available for a fee. Hotel Amenities: Concierge, currency exchange, laundry service, luggage service, maid service, safety deposit box, wake-up call. Standard Room Amenities: Air conditioning, alarm clock, remote-controlled cable TV, desk, hair dryer, in-room safe, iron and ironing board, on-command movies, pay-per-view movies, radio, refrigerator (upon request), telephone, voice mail. Minimum Age to Reserve a Room: 21 years. Policies: The maximum total number of guests (adults and children) in a room is four. Incidental Charges: For each additional person in a room beyond double occupancy, there is a charge of $35 extra per person, per night regardless of age. Hotel requires a credit card or a cash deposit for incidental charges.